UNITED NATIONS, August 30 -- Rwanda has threatened to pull its 3485 soldiers from the peacekeeping mission in Darfur if it is accused by genocide by the UN. UN spokesman Martin Nesirky on August 27 denied that Rwanda president Paul Kagame made such a threat. Inner City Press immediately asked if Kagame's foreign minister Louise Mushiwigabo had made the threat in writing. Now, quoting from Ms. Mushiwigabo's August 3 letter, Inner City Press on August 30 asked Nesirky to confirm the threat, and the UN's response. Video here, from Minute 20:13. Nesirky insisted he had confirmed but declined to “characterize the letter, the letters.” But now that the letter is known, what sense does this make? Inner City Press asked, if the word genocide is dropped from the final report, whether it will be due as reported to Ban Ki-moon's doubts if the word applies, or to the threat. Video here, from Minute 21:55. Nesirky said to wait and see, to compare the leaked and final reports. 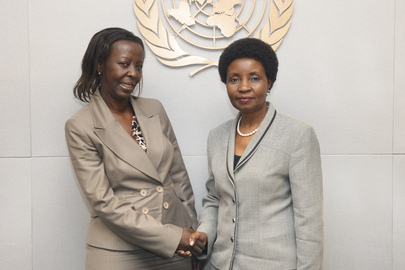 If Rwanda releases its letter or makes it threat publicly, will the UN respond? “You seem to be on a hypothetical strand,” Nesirky said. “Let's not go down that road.” Video here, from Minute 22:37. But inexorably the UN is being taken, or is taking itself down that road. On August 27, Nesirky acknowledged that Ban's office is conferring on the content of the High Commissioner on Human Rights report. 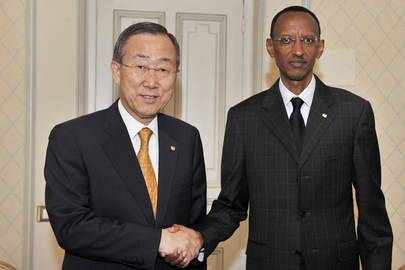 Since Ban named Kagame as the co-chair of his High Level Advocacy Group on the MDGs, one assumes Ban does not believe Kagame is guilty of genocide. So why wouldn't the conferring be editing, and excision of the “G” word? On August 27, Nesirky said the UN was disappointed that Le Monde had published the draft report. In fact, it appears that Jeane Afrique first broke news of the leaked report on August 13. Later, however, even Jeane Afrique cited Le Monde, while linking to their earlier stories. So in whom is the UN disappointed? Watch this site.